Hunting Knife - Remington Sportsman Series F.A.S.T. Remington's Sportsman Series F.A.S.T. 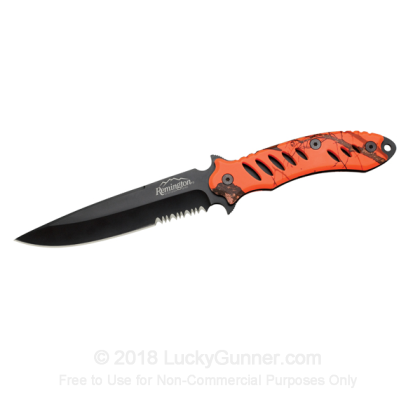 (Fast Action, Soft Touch) Hunting Knife features a comfort molded, rubberized handle in Mossy Oak® Blaze Orange, giving you superior grip and control. This is riveted to a full tang 440 Stainless Steel blade with a black oxidized coating. The blade has a spear-tip, and is partially serrated, providing the versatility you need at the range or in the forest.